The Genealogue: Achieve Life Balance With Genealogy! Since Miriam asked, I have achieved balance in my life with the help of Genealogy™. Before discovering Genealogy™, I was a 97-pound weakling. My cat ignored me and my relatives despised me. Now I weigh 98 pounds, my cat tolerates me, and my relatives hate me for a completely different reason! Just one dose of Genealogy™ lasts a full 24 hours—long enough for me to climb out of bed, transcribe one census page, then crawl back into bed. 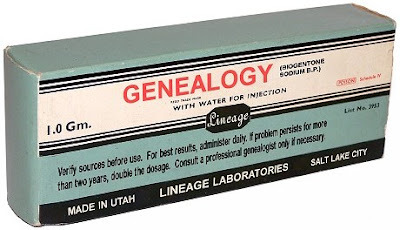 Genealogy™ addiction support groups are a great way to meet girls—some of whom are younger than my mother! Yes, Genealogy™ has changed my life in many ways. No longer do I waste time doing my laundry and taxes. My only concern now is supporting my habit and getting others hooked on Genealogy™! Warning: These statements have not been evaluated by the FDA or The Generations Network. Not recommended for children under 3. May cause drowsiness in others. I didn't intend to inspire fear. Only pity. Chris, you're amazing, I wish I had even a smidgen of your creativity. I laughed all the way through it. Thanks! OMG! Chris, I laughed so hard! Even my teenagers were giggling, and they're a tough audience! Thanks for making my day! Glad that you could find humor in my pathetic tale. I'm going back to bed now.